We're thrilled to have mapped 2 million acres across 100 countries so quickly. It took 12 months for our users to map their first million acres, but less than four months to map the next million. DroneDeploy, the leading cloud software platform for commercial drones, is making powerful aerial data accessible and productive for everyone. Today DroneDeploy announced that its users had mapped 2 million acres (over 809 thousand hectares) across 100 countries, a major industry milestone for the commercial drone sector. To celebrate the achievement DroneDeploy is releasing the industry’s first inside look at Commercial Drone Industry Trends. Analysts have projected trends within the commercial drone sector, but until now none of the major companies in the space had provided insight into what is actually happening. DroneDeploy’s global momentum enables it to share the real story of commercial drones across industries and geographies. DroneDeploy reveals that the most popular drone manufacturers used within the commercial sector are DJI, AgEagle and senseFly (acquired by Parrot). DroneDeploy’s industry insights highlight that commercial drones in Europe are primarily used for surveying, while in South America they primarily support agriculture. In accordance with analysts’ predictions, DroneDeploy confirms that agriculture is the largest commercial sector for drones. DroneDeploy also unveils that the average agricultural map is 120 acres (49 hectares), which is almost twice as large as the next largest segment, surveying. Drones used in agriculture on average fly at 375 feet (114 meters), which is 47% higher than drones flown in construction. To see the full insights visit the DroneDeploy blog. Drone aerial mapping is completely reshaping industries like agriculture, construction and mining, and DroneDeploy is at the forefront of the revolution. "I have found DroneDeploy to be a new invaluable tool within my industry. It enables me to map fields and utilize the data in an efficient manner. This system works masterfully, is well supported and cutting edge in the ag industry,” stated Gary Sorrick, General Supervisor at Del Monte Foods. Farmers use DroneDeploy to identify irrigation problems, identify pest issues like slug infestations and better manage fertilizer applications. Construction sites and mining operations use DroneDeploy to monitor site progress and measure stockpile volumes, which increases worker safety and saves thousands of dollars. DroneDeploy’s free iOS and Android flight apps dramatically simplify and automate the capture of aerial data. With just two taps, anyone with the latest drones from DJI, the world’s leading drone maker, can automatically fly and capture images, and make professional-grade maps for analysis, 3D modeling and more. Cloud-based software from DroneDeploy puts aerial imagery and insights into the hands of businesses in a way that is more user-friendly and cost-effective than ever before. To learn more about today’s announcement and the commercial drone insights visit the DroneDeploy blog. DroneDeploy is the leading cloud software platform for commercial drones, and is making the power of aerial data accessible and productive for everyone. Trusted by leading brands globally, DroneDeploy is transforming the way businesses leverage data across industries, including agriculture, construction, mining, real estate and research. Simple by design and super easy to use, DroneDeploy enables professional-grade imagery and analysis, 3D modeling and more from any drone on any device. 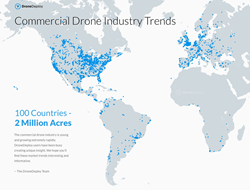 DroneDeploy users have mapped and analyzed over 2 million acres across 100 countries. DroneDeploy is located in the heart of San Francisco. To learn more visit http://www.dronedeploy.com and join the conversation on Twitter @DroneDeploy.